I saw this on AngelQueen and decided that it was just the thing for today. Posted by tantamergo in Basics, catachesis, Christendom, disaster, error,foolishness, General Catholic, sadness, scandals, secularism, sexual depravity,Society, the enemy. Many Catholics may have heard the term “modernism,” and I think readers of this blog will have seen it enough times as to induce dyspepsia, but many don’t have a strong understanding of what the term means. It’s a term that’s been around for quite a long time – well over a century – but like the heresy it is named after, modernism tends to be fuzzy and nebulous and difficult to define. Hopefully, with some help from Michael Davies, this post will help clarify this very widespread system of error. Modernism as a term dates back at least to the late 19th century, and the term received precise definition from Pope St. Pius X in his encyclical condemning modernism, Pascendi Dominici Gregis. Pope St. Pius X defined modernism not as one theological error, but an entire system of errors, built around erroneous and destructive modern philosophy derived from such minds as Immanuel Kant, Hegel, John Locke, Charles Darwin, and many others. It was a philosophical and theological system that attempted to combine irreconciliable belief systems, one political-social, and the other-scientific religious, with Catholicism. To put it more plainly, modernism attempted to reconcile Catholicism with both liberalism and belief in “scientific” evolution. As happens in all such cases, the errors of liberalism and acceptance of Darwinian evolution crushed belief in orthodox Catholicism, so that the katholycism that emerged was severely distorted, even deranged. Modernism is so dangerous because it is so all-encompassing. 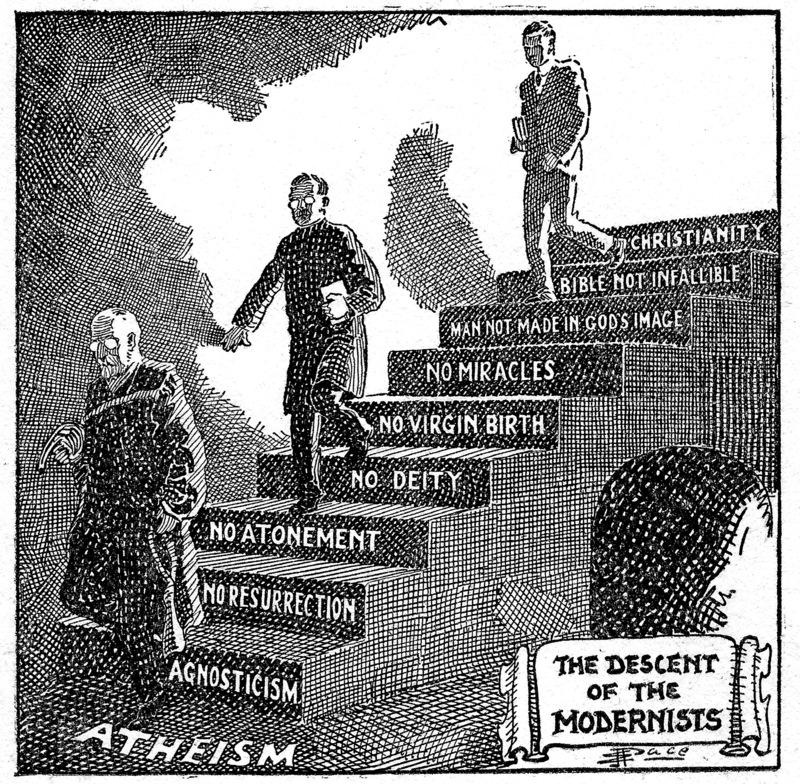 There is an old cartoon called “The Descent of the Modernists” shown at right. That cartoon pretty well encompasses how acceptance of modernist beliefs tends to progress in the minds of its adherents. Modernism has a strong capacity to utterly destroy any belief in the supernatural, to reduce God to some humanist, pantheist deity (pantheists believe that God does not exist separately from men, but is comprised of something like “The Force” from Star Wars, God is some kind of energy field or being associated with all living things, especially believers. In a sense, modernists believe we “create” god with our belief), and to severely undermine such core Christian concepts as the Incarnation, Virgin Birth, miracles, the Real Presence, even the Resurrection. I’m sure many readers have stumbled across modernist Katholycs who have told them that all the old pieties like the Rosary or Adoration are wrong – well, that is because that wayward person, under the influence of modernism, no longer believes like a Catholic, at all. Whereas previous heresies tended to attack one or a few Dogmas, modernism attacks the entire edifice of Christianity in one fell swoop, leading to apostasy, even atheism, in any practical definition of the term. But modernism does not just attack Christianity (although its results are most devastating there, because Catholic Christianity forms such a cohesive theological-philosophical whole), it attacks any religion postulating belief in a transcendent God. This aspect of modernism is why Pope St. Pius X called modernism “the synthesis of all heresies,” because it is such a totality of disbelief and rejection that it encompasses all the previous heresies, while adding still more error to its destructive mix. I believe it was the great St. Augustine who said that of all the sins, sins of intellectual pride are the most difficult to overcome. Modernism has always appealed most to the intellectual elite, who, like new gnostics, develop a highly arcane belief system that only the “enlightened” can accept and believe. Those without the special knowledge of the gnostic/modernists are Philistines, cast out from elite academic/intellectual circles and constantly derided in modernist circles. A “pack mentality” develops (described brilliantly by Pope St. Pius X in Pascendi), which has been particularly effective in enforcing lock-step acceptance of modernism, especially among academia and those with intellectual ambitions. This explains why modernism has been so incredibly effective at penetrating the Catholic university and turning almost whole religious orders – especially religious orders with an inordinate focus on intellectual pursuits, like the Jesuits – over to this synthesis of all errors. Modernism tends to start very subtly. It starts with a revered teacher making snide remarks about “errors” in the Bible to his class. Or with a priest darkly hinting at the Blessed Mother’s ”unchastity” prior to the Virgin Birth. Soon, attacks on “fairy tales” like the Creation history of Genesis 1-3 moves onto attacking the reliability of the Gospels themselves. Soon, the teacher, assuring the class that only silly old women still believe the Catholic fairy tales, and sometimes viciously mocking those who attempt to defend the Faith, is openly questioning the Divinity of Christ and almost any Dogma you care to name. Slowly, by degrees, the students are either won over wholeheartedly to modernism, or they are at least left bewildered skeptics, unsure of what to believe, and easy prey for “concerned” protestant friends. This paragraph probably roughly sketches the experience of millions of souls over the past several decades, especially those innocents entrusted by their parents to Catholic schools, which, being a lower arm of academia, are absolutely infested with modernism. But even those of us who have never attended Catholic schools, existing as we do in an intellectual milieu almost totally gone over to modernism, and with the former bastions of the Church deliberatey razed to allow the forces of modernism to run amok in the Church, rarely escape being affected with its errors. It is difficult to explain just how much the thinking of the average – or even the far above average – Catholic has been modified and degraded by the pernicious influence of modernism. Even the very best Catholics often have some modernist baggage they are unaware of, the fruit of swimming in error infested waters their entire life. I strongly advise reading Pascendi, and then slowly and prayerfully examining one’s own life for the presence of modernist beliefs. I know I haven’t, perhaps, given a complete definition, but I am out of town for today. I will, God willing, expand on this definition in the coming weeks, with the help of Michael Davies book Partisans of Error: St. Pius X Against the Modernists.